My stores have been open on zazzle.com for about five years now. A lot has changed in that time. My stores have grown, zazzle itself has grown and I can now look back on my records to see what items have done the best over the whole period. To me this is a happy little card. 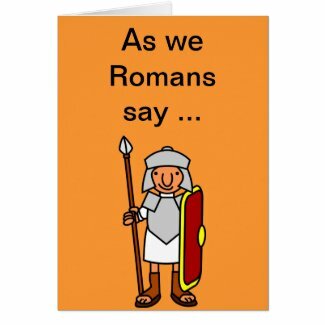 One of the reviewers of the card commented on the novelty of a Latin greeting to fit the image of the Roman Legionaire. It is viewed several times per week and looks to keep it's position as a best seller for the time being. The only non card item in the top ten sellers is a cup, or mug. This mug was actually created by my wife. She wanted it to be a retirement gift for a friend from her workplace. It turned out so well that we posted it for sale and here it is at ninth best-selling item in my store. The template was also added to several other items, shirts, cards etc. it has proved very popular on all types of items. A good reason why you should always have a camera handy with you. This item the Amtrak Locomotive Wallet is my eleventh best selling item. The locomotive and train were loading as I took the photograph, just as a personal interest picture. Thinking it may be of interest I posted the picture on cards and this wallet. Bang it was an instant best seller, the card with this image being one of my top ten as well as this higher value item being a good seller. I hope this insight into my zazzle best sellers might have been informative. If you have any questions or comments please fell free to post in the comments below.